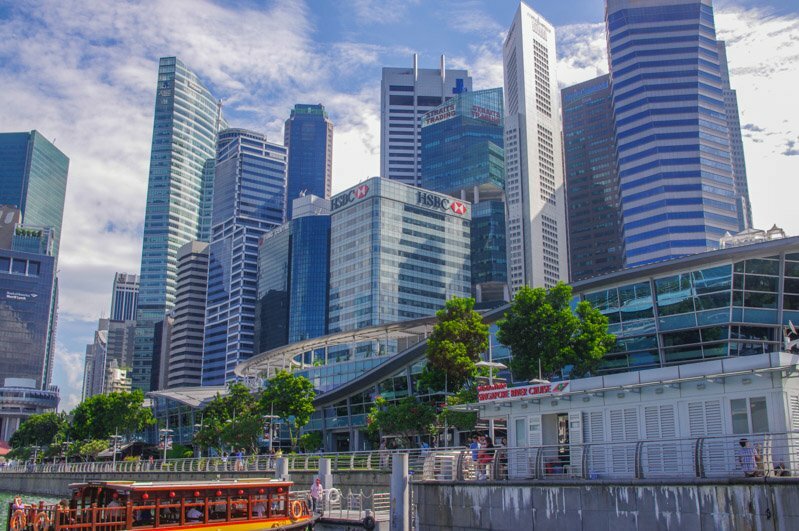 Singapore is unlike many Asian cities. It looks impressive, organised, and is a super clean city making it a fun stopover for those with a bit of extra cash. 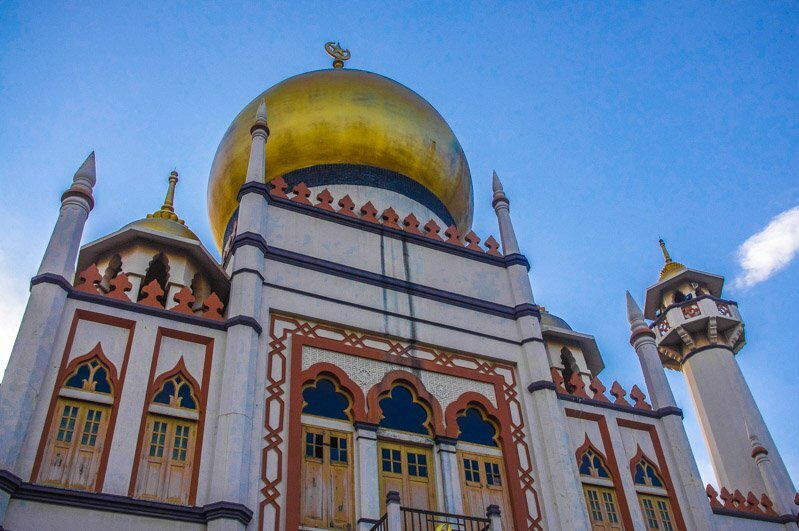 Singapore was the first stop in our South East Asia five-week tour however we cheated a bit. Yes, we had backpacks but we were living the high life at Craig’s uncle and aunty’s apartment – equipped with a rooftop infinity pool nonetheless. However, I did dig out some of the budget-friendly things to do in Singapore as well as the normal touristy trips! Singapore is clean. Craig nearly vomited on the underground after taking a malaria tablet, luckily he managed to make it to a toilet, just. We’d heard horrible rumours that if you are sick in public you are fined and have to clean it up yourself! Singapore is not cheap so wasting money is not an option. I love the ‘shows’ (coming from a town which has an annual fairground all summer) so Universal Studios (although screamingly tourist) was a must. We spent the day on the rides with minimum queuing (weekdays are best) then watched a very well organised light show on the beach from Sky Bar on Sentosa Island (one of two light shows, there is the official one at Marina Bay). It was happy hour at the bar – £150 for four cocktails and six beers, the reality of the price of alcohol in Singapore! 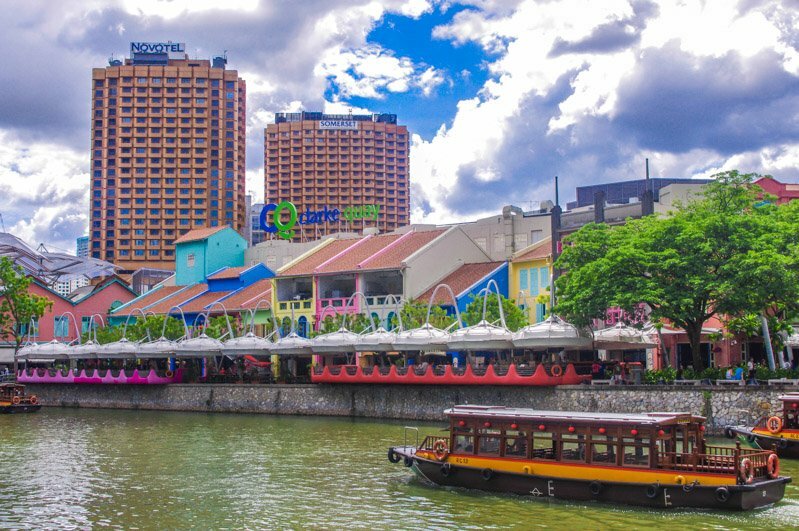 I recommend a water boat tour which motor off from Clarke Quay (pubs, restaurants) and it takes you along Marina Bay. 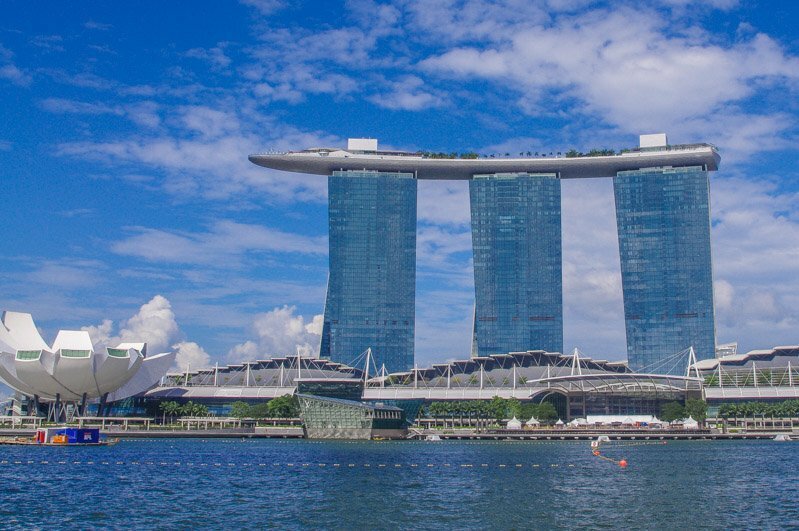 My favourite building is Marina Bay Sands Hotel, if you stay at this very swanky hotel you get to use their rooftop pool, I’d guess it offers the best views of Singapore! One day… You can see availability and Booking.com or TripAdvisor. Check out this review of Marina Bay Sands by James at Nomadic Notes (lucky sod!) Obviously there are cheaper holiday rentals in this expensive city. Cliché, I know, but Singapore Slings at Raffles Hotel is fun. Remember to throw the peanut shells on the floor. Hey, veggies! Check out these vegetarian restaurants in Singapore. 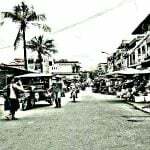 Like most cities, Singy is great for wandering about. I enjoyed our stroll through Chinatown, unusual smells, soon to get used to) and Arab Street. The temples are welcoming too, remember to cover up, clothing is provided. One of the highlights for me was watching the sun go down and dusk settle in from 1 Altitude, which is a relaxed rooftop bar with live music and is genuinely reasonably priced! Singapore actually has over twenty rooftop bars (they know their audience) so there is plenty to choose from if you there are for more than one night. There’s even a microbrewery roof top bar, find out more here. Singapore is rated the world’s most expensive city so finding where to stay, eat and what to do on a budget may be a challenge but not one that can’t be met. 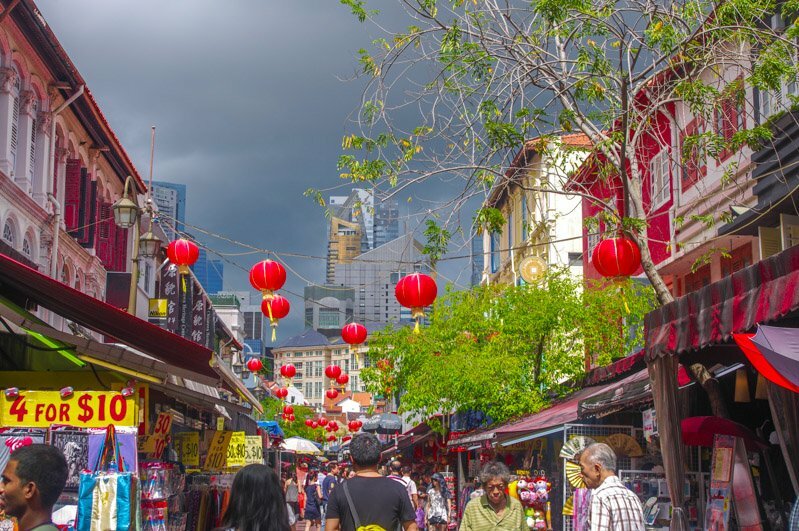 There’s one place that will still satisfy the taste buds as well as the purse strings when looking for where to eat in Singapore on a budget and that is hawkers centres. These food halls/courts. Some are found at the top of shopping centres/malls and are clean and offer tasty economical local food. This was the one time we quickly picked up the bill to say thanks to Craig’s family for hosting us (all of the other times were just ridiculous!) Meals are typically under £3/ S$5. Alcohol is taxed high so it is expensive. You can find beer for £3-5 in hawkers centres but expect to pay £12 for a pint in touristy areas, this just leaves a bad taste in my mouth! Wondering what to pack? Check out this Southeast Asia packing guide. 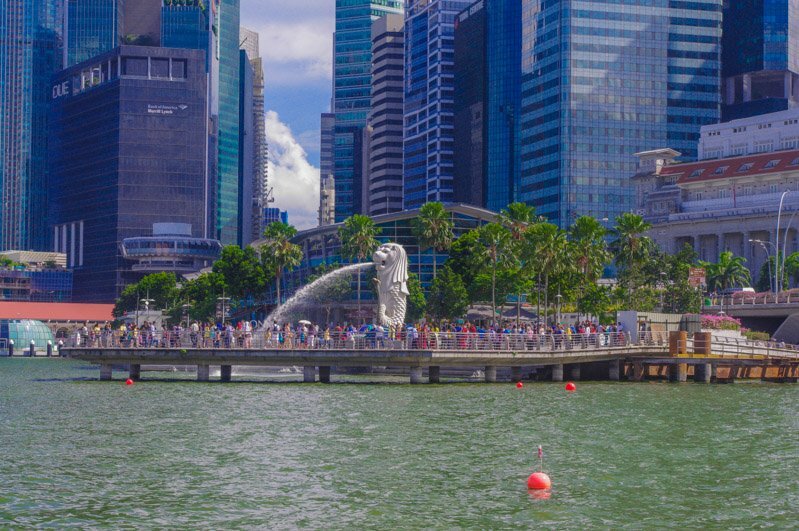 Budget accommodation in Singapore is also a challenge, many of the hostels and hotels that are lower in cost are not in a great location for those travelling without a car. The transport system is great, you can buy a Singapore Tourist Pass which is unlimited travel for S$10/£6 (one day) or S$16/£9 (two days) or S$20/£11 (three days) so aim to book your Singapore hotel or hostel close to a Mass Rapid Transit (MRT) and Light Rail Transit (LRT) station to stay connected in the city. I particularly like the idea of the capsule hostels in Singapore, this boutique capsule is reasonable at around £17. Capsules are great because they are super private (a curtain pulls over your bed) so although you are in a hostel you don’t have to mingle if you’d prefer privacy. You can read more reviews and/or book here at TripAdvisor. The price point very much depends on the area, here’s a guide to Singapore’s neighbourhoods! Singy was a unique experience for me, I feel cheeky writing about it in a blog as I know it’s not really our textbook travelling behaviour. I know it’s expensive but it is worth a whirl if you want to dine, drink and take in the views (four days was tops for us). 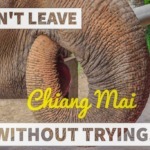 If you are looking for cheaper alternative places to visit, check out our long-term travel tips. Wow, the rooftop pool looks amazing! We didn’t have one when we were in Singapore…therefore, a good excuse to go back! This was Craig’s aunty and uncle’s pad! I do really want a go in the Marina Bay Sands rooftop pool one day so I might see you there! I really recommend getting up high at dusk and stay until dark, have a ball!